Late Shree Hariprasad Chunibhai Patel, one of the principal members of Dharmaj Samaj in Kenya arrived in London in 1970 and immediately joined DHASOL and moulded the path forward with the experience he had brought with him. He had a vast pool of knowledge, experience and personal understanding of individuals that made him a valuable asset to the society. Every one who was associated with him or worked with him appreciated his qualities and he was popularly known as a walking directory. You only had to meet him once and he would register your complete family association into his memory. Sadly he passed away a few years ago and the society indeed misses him deeply. Anyone who had worked or associated with him would have learnt a lot from him and no one can replace his qualities. Haribhai was very learned and had personal knowledge of the majority of the people from Dharmaj and he had only to meet a person once to digest knowledge about that person and his ancestors and connections etc. He had been gifted with the art of making conversations with people of all ages, and indeed he would talk to any person from Chha Gham Patel community and find some or other relationship and rapidly engage in meaningful conversation. He was one of the most respected senior members in the whole Chha Gham community and very few people would not come in contact with him some time or other. He held Dharmaj Society of London together and worked very well with all the members and made DHASOL his hobby and life interest. He was one of the most enthusiastic and eager workers and even in his seventies was the first volunteer to travel by public transport from South London to North London to attend Navratri festivities daily on each of the nine days, man the entrance hall and collect donations relentlessly. Shree Hariprasad was intelligent and most respected member of the Society for many years and determined for the Society to remain a stable and respectable institution representing our community. He was very eager for the Society to acquire our own property and become a registered Charitable Organisation from an early stage. He was President for the Society for several years and oversaw many changes and was always seeking to engage respectable individuals to join our committee. Later he accepted the position as an active Trustee until his passing away. We are deeply honoured by the valuable contribution that Shree Haribhai Chunibhai Patel made to the development of Dharmaj Society of London and very much miss his association and in particular his guidance. Shree Bhaskerbhai, his wife Jyostnaben Patel and his family have been enthusiastic supporters of DHASOL from the early years and had remained part of the committee for many years. He was a popular President for the Society and had represented the Society well at all affiliated organisations and had also been chairman of Chha Gham Nagrik Mandal UK for several years. He had always found time for the Society despite his business commitments and having to travel long distances from Colchester to attend regular committee meetings and community events. He has been a determined sponsor for any project that would benefit Dharmaj and has enthusiastically supported our Sharda Maternity Hospital project from the very beginning and was on the special hospital fund raising committee. We thank them and their family for their continued encouragement support and assistance and know that we can continually rely on without hesitation. He still has a lot to offer to DHASOL and we count on his continued active and positive support. Shree Jagdishbhai Rambhai Patel was born in Njoro, Kenya on 21 Feb 1936. He spent his childhood in Dharmaj following which he studied for his Bachelor in Arts in Mumbai, later moving to Africa and spent his youth in Nairobi. He then moved back to India and married and settled there, until 1985 when he came to the UK. His travels gave him both a love for Indian culture and a broad outlook .His jovial and friendly nature ensured a wide circle of friends and social contacts. Jagdishbhai was an experienced book keeper and managed his own book keeping firm and was loyal and trusted member of DHASOL. He was keen with figures and acted as DHASOL's Treasurer for some 18 years. He accepted his role with professionalism and even at the ripe age of 70 he was full of enthusiasm and carried on his duties relentlessly to perfection. He insisted in accounting for each penny spent by the Society, and generally would not rest until his Cashbook balanced and reconciled. No one could wriggle a penny from him without producing valid vouchers. He was jolly and humours and enjoyed his figure work and remained a true lieutenant to his cause and was a back bone to our Society. He served us very well and we were never willing to dispense with his trusted services, and he was equally attached to us. He sadly passed away in August 2006, whilst still holding the position of Treasurer and his kind services are being missed a lot. It would be difficult to find a person of his calibre, to take over his role. His contribution in the development of DHASOL will always be remembered with great pride, we were fortunate to benefit from his talent and his absence is being greatly missed. Late Shree Pranjivanbhai was a retired solicitor's legal clerk, attached to DHASOL since its formation. He held the position of President and Secretary to the Society and was an advisor on legal issues. He acted as Trustee for the Society from the time the Society became a registered charity and he stepped down from the position because of his poor health. Jamukaka sadly passed away in February 2009 and he will be greatly missed. 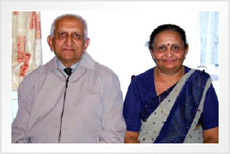 Shree Narendrabhai had initially come to the UK in early 1960s to study Chartered Accountancy and indeed was one of the very few initial Chartered Accountants from the Patel community and appropriately is still very much respected and most looked upon for guidance and help. He has a wealth of experience in business and social issues and his respect in the community has been of immense value to the society. Narendrabhai has been a long standing and respectable member of the Society for many years and honoured the Society by willingly accepting the role of President and later as an advisor and most recently as a Trustee until his retirement owing to work commitments. He is a proud "Dharmajwala" and continues to carry DHASOL flag all time and is always willing to help us when ever needed. We appreciate his contribution to the development of DHASOL and wish him well in his retirement. Shree Manubhai Muljibhai of Ranoli, a close long-time associate and friend of Manharbhai Hirabhai Patel, passed away a few years ago. He retired from his UK business many years ago and spent most of his retirement in India. However, he came out of his retirement to play a crucial role during 2003 and 2004 in the construction and furnishing of our Sharda Maternity Hospital and the doctors' houses and nurses' quarters at Dharmaj. When he came to learn that DHASOL was planning a maternity hospital for Dharmaj he instantly volunteered his services and took upon himself to organise meetings with architects, planners and builders to ensure that the project was properly planned and initiated. Once the plans were agreed and builders chosen, he supervised the entire construction and assured that all stages were completed on target time without compromise on quality. His constant supervision of works and regular progress updates to us in London ensured that the hospital would open on schedule. He did all this with absolute dedication and true commitment without worrying about his time and out of pocket expenses, none of which hehas ever claimed from us. He handed over to us a well-documented report for all costs involved in construction and furnishing of the hospital. His involvement with the hospital continued after completion of the adjoining doctors 'houses and nurses' quarters. He willingly accepted the role of a manager for the hospital and quickly instigated an appropriate system for proper management and accountability. He provided us with regular reports upon usages, statistics for births and financial performance etc. We are truly indebted to Late Shree Manubhai for offering his voluntary services to us with such dedication and commitment, which allowed our project to be completed within such a short space of time in this manner with quality end product. He continued with his duties until he was sadly incapacitated following a stroke whence, he had to give up on his good work. A few years later he passed away. Although not of Dharmaj origin, Sushilaben and Viranchibhai had adopted Dharmaj and Dhasol with great love and affection. They have for many years volunteered and contributed to all of our events and are honorary life members of DHASOL. Sadly, Sushilaben suddenly passed away early 2017 leaving a great void in DHASOL and in her family. Sushilaben was a most reliable volunteer who could be called upon at any time and she was always dependable to say yes without any hesitation, irrespective of her own family and commitments to their shop. Sushilaben had been at the forefront of catering for all our events. It was her passion to create tasty recipes and this led her to bring together the ladies of the committee and other volunteers so that they could all do this together, rather than use outside catering. The main idea was to help save costs and bring the ladies together so that they feel that they were doing something for the Society too. Sushilaben had always led actively with the catering arrangements and this in turn had brought together a united team spirit with-in the committee. Sushilaben had also been involved in our Navratri festival for many years and without fail she attended every single day to help set up the Mandir and dress Mataji. She was a very creative and passionate volunteer and encouraged others to take part. Viranchibhai has also helped us more logistically in the sense that before we had our own property to cook in, he would allow us to use the space at the back of his shop to store our cooking equipment, and even allow us to prepare food there for our events. We greatly appreciate their help and assistance given to our Society without any expectation of any reward or acknowledgment and hope that we continue to receive support from Viranchibhai for many years to come. We are profoundly proud that Rashmiben, daughter of Late Shree Pramukhbhai Pujabhai Patel and Shreemati Sumitraben Pramukhbhai Patel of Dharmaj was awarded MBE for recognition of her services to dentistry and charity. It is a long established and eagerly awaited British tradition to look forward for the announcement of the Queen's Birthday Honours List. The awards recognise and reward consistently outstanding performance in all walks of public life, from education, to sport, to healthcare. One such Hampstead based dentist, Rashmiben Patel's impressive achievements in the field of dentistry earned her a deserved MBE in 2004, recognising nearly thirty years work not only in her own practice but as an appointed dentist to the Royal School of Hampstead and at Howard House Home for Children in Hampstead, an examiner for the national Dental Nurses qualification, as a core mentor for the Central London Study Group for Dentists and as an examiner for the Royal College of Surgeons. She has also been President of the Anglo-Asian Odontological Society , through which she has organised many successful Charity events. Dr Rashmiben Patel's award was for Services to Dentistry and Charity and for her contribution as a member of the Standing Dental Advisory Committee. She is very proud of the many wonderful people she has met and worked with in these areas of her profession, however she is most proud of her family especially her children who are both dentists and practising in London. Rashmiben was born in 1952 in Tanzania and is the eldest of three children. She went to India to for further education where she accomplished her qualification as dentist. She was later to marry in India and move to London and establish her own practice. Dharmaj Society of London thanks Dr Rashmiben for bringing to general attention the contribution that our community continues to make to the society we live in.We wish her and her family well and trust that others would be inspired to follow her lead. 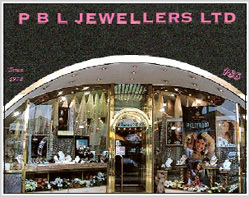 PBL Jewellers is recognised as a reputable family business specialising in diamond and gold jewellery. Their pedigree can be traced to more than three generations in the manufacture of hand made bespoke ornament creations. In fact, it was Odhavjibhai Soni who was responsible for the on-site hand crafting of jewellery in Dharmaj. Then Chandubhai Odhavjibhai Soni migrated to Zambia establishing a successful trading business. In 1976 he decided to move to London to seek out new opportunities. Market surveys reflected a need for specialist Asian jewellers and the showroom on Ealing road was opened in 1978. Having left university, Prashantbhai became more involved in the family business from the early nineties. His mission has been to maintain the long standing culture of integrity and honesty at PBLwhilst continuing to provide a diverse client base with products that reflect changing fashion trends and the latest in designs. Prashantbhai and his family have been dedicated supporters of Dharmaj Society of London for many years. They regularly sponsor our events, donate gifts for raffle prizes and help to advertise our functions through their trustworthy business. They have always remained loyal to Dharmaj and are well-known throughout the Samaj due to their consistent donations to the society. Late Shree Kanubhai C Patel was a senior Director in a prominent Pharmaceutical and General family business as well as a founding Trustee for Dhasol. Kanubhai was born and educated in Dharmaj and has maintained close links and keen interest in development of his native village throughout and has been supportive of projects for the improvement of lives for locals. Like many from his generation, he left India in the 1950s for the betterment in family livelihood and sought settlement in Uganda. He was recruited in 1956 by a new Life Insurance Company to set up an initial office that was later to become part of Life Insurance Corporation of India. He retained an agency with LIC whilst he took up employment with Uganda Company where he was quickly promoted as principal buyer. His agency with LIC earned him prestigious award in 1969/70 for achieving world’s number one agent by placing policies earning around 14 million shillings premium income. The exodus events in Uganda led him to quit the country in 1972/3 and come to London. He took up employment with Lucas Group as quality controller for automotive spares and remained with the company for some ten years. He thus ensured a good education for his children all of whom attained professional qualifications and all of whom now play an active part in the family business initiated by Kanubhai. Kanubhai joined Dhasol as a committee member in 1974 and quickly began to play an active role in management of the committee. His professional mannerism earned his great respect from the members and fellow committee members. He held several responsible positions and was a popular president for several years and was later elected as one of the initial Trustees upon Dhasol becoming a registered charity. Kanubhai and his family were very enthusiastic supporters for all of our charitable activities and always lead from the front by setting the example of offering substantial donations and moral support. It is entirely with their support and encouragement that we were able to take courage and proceed with our grand project of Sharda Maternity Hospital that has earned fame to Dharmaj and Londonwasis Dharmajwalas. Kanubhai passed away in 2018 whilst holding the position of Trustee. He has left a huge void in DHASOL. He will be missed very much by all the Trustees, committee members and everyone who knew him. His wife Shardaben and her family will continue to support DHASOL with all our work.